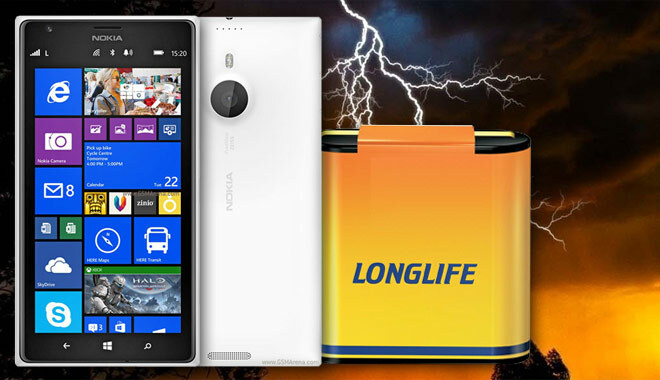 Our review of Nokia Lumia 1520 is ready, and now so is the phablet’s battery life test. We already gave you a peak of the phablet’s impressive scores and now is time for the full breakdown. Lumia 1520′s battery has admirable capacity of 3,400mAh, but the device also comes with a massive 6″ display to light up. Previous Lumia encounters have shown Windows Phone 8 to be a mixed bag when it comes to effeciency, but this is a completely new version we are having here. Our first stop is the 3G talk time endurance test. We put the phablet on a call with another device and its battery went flat after 28 hours and 34 minutes! Yes, it is the best score we’ve encountered so far. Next we put the Lumia 1520 through our web browsing routine. Even though it was connected to Wi-Fi all the time and the 6″ display was in action, the Lumia 1520 battery died after 12 hours and 40 minutes. It is the second-best score in our chart, just 5 minutes short of the Sony Xperia C champ. Finally, we’ve left the Lumia 1520 do a looped video playback and it lasted 12 hours and 31 minutes before the battery juice dropped down to 10%. It may not be among our top five results, but it is still an impressive score considering the size of the screen. So, the massive battery and power-efficient display were made to count in video-playback and web browsing test, while the ample capacity yielded very impressive talk time and stand-by endurance. Adding the numbers together produced a great 107h overall rating. By the way we had some questions how we did our stand-by test – the Glance Screen was set on peek (white color) and the Double Tap to Wake option was turned on. With that kind of overall rating, the Lumia 1520 is the best performer we have seen and well ahead of the other phablets we’ve tested so far. 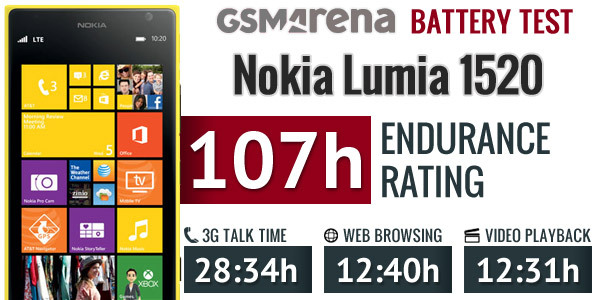 What this number means is that the Lumia 1520 should manage four and a half days on a single charge if used for one hour each of calls, web browsing and video playback daily.